The Mainstream Media (MSM) is in its death throws as more of the American public … and in fact the global population awaken to the misdirection, redirection and disinformation being dumped on us continuously. This is now the purveyor of our new norm, what permeates all of what we are supposed to believe and understand. 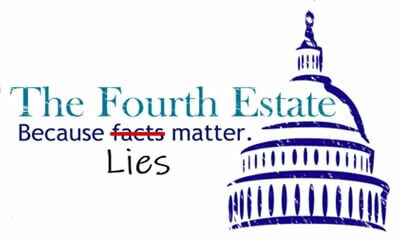 Today we suffer not only the tyranny of a hostile shadow government or deep state, but also the massive corruption and complicity of The Fourth Estate otherwise identified as the MSM or the Press. In modern history the press has failed us miserably, aligning themselves with those who would subvert our freedoms and liberties for the benefit of a few elitist oligarchs, or would-be emperors. This has never been so blatantly apparent as what we saw in the farce we witnessed during the past Presidential election. Information perversion by the media, its challenge of the voice of “We The People”, the major push to overturn our voices via (failed) recounts, skewed polls, misrepresented facts and outright lies, all unprecedented in American history. What follows was originally written in 2014 … about four years ago, but is so profoundly on target that we felt it important that it be revisited. If anything the eleven points have been severely exacerbated in recent years as the MSM’s allegiance to the Deep State or Shadow Government is laid bare for all the world to see! The truth is that ideas and opinions are as vastly different as grains of sand on a beach, yet the media intentionally frames every issue in terms of a phony left-right paradigm that has been constructed to pigeon hole complex ideas and interests into a cheapened thought prison. No unorthodox idea or point of view can reach critical mass because everything is automatically framed in a ‘with us or against us’ mindset, turning people against each other for no reason other than to appeal to our desire to be on the winning team. This article (11 Tactics Used by the Mainstream Media to Manufacture Consent for the Oligarchy) was originally created and published by Waking Times and is published here with permission and attribution to author Sigmund Fraud and WakingTimes.com.